Hunger Games Panem Map. . HD Wallpaper and background images in the The Hunger Games club tagged: hunger games hunger games map of panem panem map district 12 the hunger games map panem capitol. This The Hunger Games fan art might contain sign, poster, text, and chalkboard. 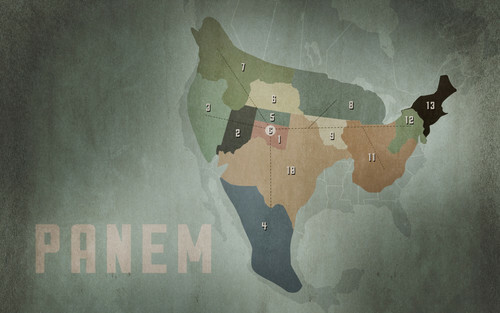 This is a map of Panem, based on the Hunger Games. I used information within the books along with North American flood maps and elevation maps to generate the boundaries for the country and districts. I also took into account the locations of existing industries (Iowa for corn growing, Texas/Oklahoma for cattle, California for technology, Nevada for weapon testing, Washington/Canada for lumber) and applied that information to the district boundaries. The dotted lines denote high speed train tracks. This is awesome!! I've tried finding maps before but this has to be the best one yet, good job!! I think it is realistic, and great job!